My mad handyman skillz, cont. And today I assembled two nightstands with nothing but my bare hands, a phillips head screwdriver, a set of incomprehensible directions and my wits. Do you know how expensive nightstands are? More expensive than you’d think. The only nightstands I’ve owned have either been cardboard (true story) or thrift store castoffs. 1) We had no nightstands. 2) We had no suitable storage area for out of season (or out of size, who are we kidding?) clothing. So, I surfed over to Amazon, found suitable nightstands and bought two. The boxes arrived this afternoon, so armed with my phillips screwdriver, I began assembling. The nightstand came in fifteen separate pieces. And the kids complain you’ll never use geometry again after high school! I only put two parts on backwards but no one will ever know if you don’t tell. So don’t tell. And now, my bed is nestled between two actual nightstands. Total cost? $113.98. Take that, Pottery Barn! p.s. Hey, wait! Is that screwdriver a phillips head screwdriver? 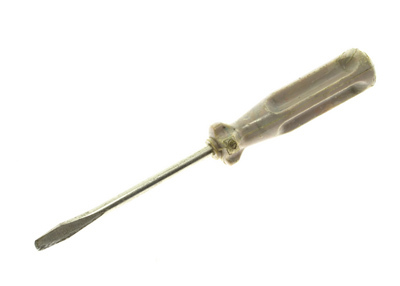 Because that’s the picture that I found when I Googled “phillips head screwdriver” . . .
p.p.s. I thought I was right about the screwdriver . . . apparently I’m smarter than Google. Heehee… my husband has taught me the difference in the screwdrivers, but before him I had no idea! Great job on the nightstands… going to share some pictures? That’s definitely a flat head screwdriver, not a Phillips. A phillips screwdriver has the four thingies, crosshairs, whatchamacall’ems. 🙂 But yay for putting them together – you’re not the first person to put things on backwards, says I, smiling sheepishly. you have no idea how many times i have had to ask God to help…cause i couldn’t get something put together…everytime He has helped me. He is the great provider…!!! Looks like He is stepping in while the hubby is away. I’d say your experience putting together the lawn mower in your living room many years ago, was your training ground on making things come together. Now you should be able to get more pay – no longer a novice!